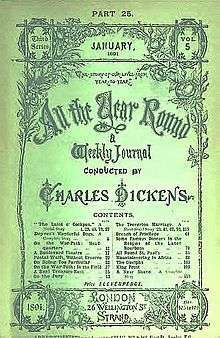 All the Year Round was a Victorian periodical, being a British weekly literary magazine founded and owned by Charles Dickens, published between 1859 and 1895 throughout the United Kingdom. Edited by Dickens, it was the direct successor to his previous publication Household Words, abandoned due to differences with his former publisher. It hosted the serialisation of many prominent novels, including Dickens' own A Tale of Two Cities. After Dickens's death in 1870, it was owned and edited by his eldest son Charles Dickens, Jr., with a quarter share being owned by the editor and journalist William Henry Wills. In 1859, Charles Dickens was the editor of his magazine Household Words, published by Bradbury and Evans; a petty dispute with them led Dickens to realize that he was at the publisher's whim, and to decide that he would create a new weekly magazine that he would own and control entirely. 'The story of our lives, from year to year.' – Shakespeare. The new weekly magazine had its debut issue on Saturday 30 April 1859, featuring the first instalment of Dickens's A Tale of Two Cities. The launch was an immediate success. One month after the launch, Dickens won a lawsuit in the Court of Chancery against his former publisher Bradbury and Evans, giving him back the trade name of his previous journal. On Saturday 28 May 1859, five weeks after the launch of All the Year Round, Dickens terminated Household Words, publishing its last issue with a prospectus for his new journal and the announcement that, "After the appearance of the present concluding Number of Household Words, this publication will merge into the new weekly publication, All the Year Round, and the title, Household Words, will form a part of the title-page of All the Year Round." AYR's full title then acquired a fourth item: " All the Year Round. A Weekly Journal. Conducted by Charles Dickens. With Which Is Incorporated Household Words. " All the Year Round contained the same mixture of fiction and non-fiction as Household Words but with a greater emphasis on literary matters and less on journalism. Nearly 11 per cent of the non-fiction articles in All the Year Round dealt with some aspect of international affairs or cultures, discounting the American Civil War, which Dickens instructed his staff to avoid unless they had specifically cleared a topic with him first. Old tales of crime (especially with a French or Italian setting), new developments in science (including the theories of Charles Darwin), lives and struggles of inventors, tales of exploration and adventure in distant parts, and examples of self-help among humble folk, are among the topics which found a ready welcome from Dickens. After 1863, although Dickens continued to micromanage the editorial department, scrupulously revising copy, his own contributions fell off considerably, largely because he spent more and more time on the road with his public readings. A few weeks before 28 November 1868, Dickens announced a new series for All the Year Round: "I beg to announce to the readers of this Journal, that on the completion of the Twentieth Volume on the Twenty-eighth of November, in the present year, I shall commence an entirely New Series of All the Year Round. The change is not only due to the convenience of the public (with which a set of such books, extending beyond twenty large volumes, would be quite incompatible), but is also resolved upon for the purpose of effecting some desirable improvements in respect of type, paper, and size of page, which could not otherwise be made." After hiring him as the subeditor of the magazine a year earlier, Dickens bequeathed All the Year Round to his eldest son Charles Dickens, Jr. ("Charles Dickens the younger" in the testament) one week before his death in June 1870. After Dickens' death, his son would own and edit the magazine from 25 June 1870 until the end of 1895 (or possibly just until 1888). In 1889, the magazine started a "Third series". It is unclear how much Dickens Jr. was involved with the new series, but a number of stories were contributed by Mary Dickens. The Haunted House in the Extra Christmas Number (13 December 1859) with Wilkie Collins, Elizabeth Gaskell, Adelaide Anne Procter, George Augustus Henry Sala, and Hesba Stretton. A Message from the Sea in the Extra Christmas Number (13 December 1860) with Wilkie Collins, Henry F. Chorley, Charles Allston Collins, Amelia Edwards, and Harriet Parr. Tom Tiddler's Ground in the Extra Christmas Number (12 December 1861) with Wilkie Collins, John Harwood, Charles Collins, and Amelia Edwards. Mrs. Lirriper's Lodgings in the Extra Christmas Number (12 December 1863) with Elizabeth Gaskell, Charles Lever, Amelia Edwards, Charles Allston Collins, & Edmund H. Yates. Mrs. Lirriper's Legacy in the Extra Christmas Number (1 December 1864) with Charles Allston Collins, Rosa Mulholland, Henry Spicer, Amelia Edwards, & Hesba Stretton. Doctor Marigold's Prescriptions in the Extra Christmas Number (12 December 1865). The most famous story in Doctor Marigold's Prescriptions is one of Dickens' own contributions, The Trial for Murder (aka To Be Taken with a Grain of Salt). Mugby Junction in the Extra Christmas Number (12 December 1866) which includes a masterpiece of short fiction, The Signal-Man (aka No. 1 Branch Line: The Signalman). No Thoroughfare in the Extra Christmas Number (12 December 1867) with Wilkie Collins. Most articles were printed without naming their author; only the editor, "Conducted by Charles Dickens", was mentioned on the first page and the head of every other page. While a complete key to who wrote what and for how much in Household Words was compiled in 1973 by Anne Lohrli (using an analysis of the office account book maintained by Dickens' subeditor, W. H. Wills), unfortunately the account book for All the Year Round has not survived. Ella Ann Oppenlander has attempted to provide something comparable in a 1984 book not easily procured, but only manages to identify less than a third of the contributors: Dickens' All the Year Round: Descriptive Index and Contributor List. Allingham, Philip V. (30 November 2004). "All the Year Round". The Victorian Web. Archived from the original on 6 February 2007. Allingham, Philip V. (11 July 2004). "Household Words". The Victorian Web. Archived from the original on 27 November 2005. CHEAL. "Dickens. Bibliography". The Cambridge History of English and American Literature at Bartleby.com. Archived from the original on 13 January 2006. Dickens, Charles (1859–1868). "Contributions to All The Year Round by Charles Dickens". WorldWideSchool.org/library. Forster, John (1872–1874). "The Life of Charles Dickens". Lang.Nagoya-U.ac.jp/~matsuoka. LOC, US (2007). ""Full Record" tab on "Basic Search" for LCCN: "sf 96091284"". Library of Congress Online Catalogs. Overell, Richard (18 December 2006). "27. All the year round : a weekly journal. (London : Chapman & Hall, 1859–1895)". Catalog to: An Exhibition of material from the Monash University Library Collection. Archived from the original on 18 December 2006. ↑ "Jane W. Stedman, 'Wills, William Henry (1810–1880)', Oxford Dictionary of National Biography, Oxford University Press, 2004; online edn, May 2010". Oxforddnb.com. Retrieved 25 February 2014. ↑ "William Wills". Oxforddnb.com. Retrieved 25 February 2014. 1 2 Allingham, "Household Words", op. cit., last section "Wrapping Up Household Words"
1 2 Forster, op. cit., book 8, part 5: " 'All the Year Round" and 'Uncommercial Traveller' (1859–61)"
1 2 LOC, op. cit., says "Published/Created: London : Chapman and Hall, 1859–1895." and adds "Vol. 1, no. 1 (Apr. 30, 1859)-v. 20 (Nov. 28, 1868); n.s., v. 1 (Dec. 5, 1868)-v. 43 (Dec. 29, 1888); 3rd ser., v. 1 (Jan. 5, 1889)-v. 13 (Mar. 30, 1895)." as well as explicit mention of extra issues for spring 1894, summer 1894, and Christmas 1894. Plus "Notes: Editors: 1859 – June 1870, Charles Dickens; 25 June 1870–1895, Charles Dickens, Jr."
1 2 Overell, op. cit. ↑ Dickens, Contributions to All The Year Round, op. cit., chapter 1, "Announcement in 'Household Words' of the Approaching Publication of 'All the Year Round'" (28 May 1859). ↑ Dickens, Contributions to All The Year Round, op. cit., chapter 12, "Address Which Appeared Shortly Previous to the Completion of the Twentieth Volume" (1868). ↑ See sources Lieberman and Perdue at the "Charles Dickens, Jr." article. ↑ Forster, op. cit., "13. Appendix: The Will of Charles Dickens", codicil from 2 June 1870: "I, Charles Dickens [...] give to my son Charles Dickens the younger all my share and interest in the weekly journal called 'All the Year Round,' [...] In witness whereof I have hereunto set my hand the 2nd day of June in the year of our Lord 1870." ↑ Sources consulted: scans of All the Year Round (1869, 1870, 1871, 1882, 1884) at Google Book Search. In the 1870–1871 magazines, the head of pages had the original "[Conducted by Charles Dickens.]" replaced with "[Conducted by Charles Dickens, Jun.]" (at least by 1882, it was back to just "[Conducted by Charles Dickens.]") Associated metadata say, "Editors: 1859 – June 1870, Charles Dickens; 25 June 1870–1895, Charles Dickens, Jr." Exact same textual data at LOC, Google is probably using the same source database as LOC. 1 2 Allingham, "All the Year Round", op. cit., quotes again "[Drew 12]" saying that AYR "continued under Charles Dickens Jr.'s editorship until 1888", but it's the very same quote claiming AYR stopped in 1893 instead of 1895, which weakens its credibility; both bits of information are also found at David Perdue's Charles Dickens Page.com, but probably derived from the same source. Ultimate confirmation or refutation would demand research in library collections, so as to find or not physical issues for 1894 and 1895, and to check the "conducted by" line of post-1888 issues. The LOC 3-series timeline indeed sets a series change at 1888, maybe Dickens Jr's involvement changed at that point. ↑ Allingham, "All the Year Round", op. cit., quotes his 1999 source "[Drew 12]" saying that AYR "ceased publication in 1893", but it seems to be an error or a typo. All book and library databases such as Worldcat.org list the series as "1859–1895". LOC and Overell concur. 1 2 CHEAL, op. cit. ↑ "VAMPYRES AND GHOULS (1871) by anonymous". Web.archive.org. 2 May 2003. Archived from the original on 2 May 2003. Retrieved 25 February 2014. Oppenlander, Ella Ann (compiler) (1984) [1978 thesis]. Dickens' All the Year Round: Descriptive Index and Contributor List. Troy, NY: Whitston Publishing Company. ISBN 0-87875-252-8. Wikimedia Commons has media related to All the Year Round. Dickens Journals Online, an online edition of Dickens' journals, Household Words and All the Year Round. Opening page of the Christmas 1859 extra issue, with Dickens' short story "The Haunted House"